Have you got a creative child? Then you’re going to love this! 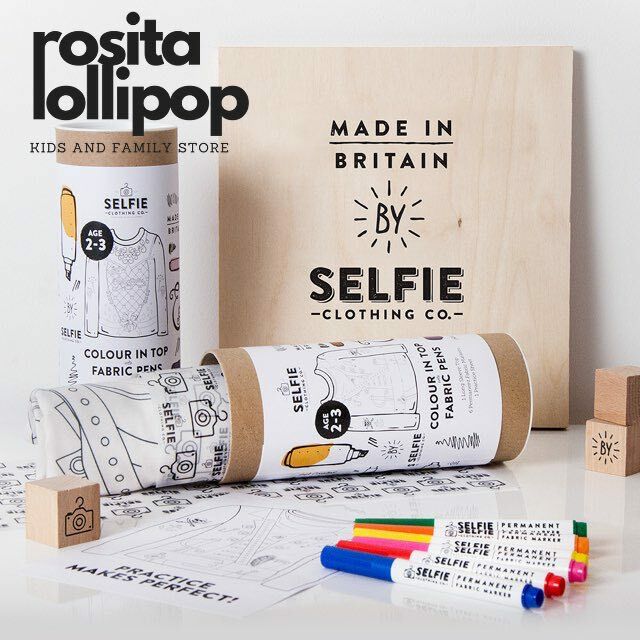 We’ve teamed up with the fabulous Rosita Lollipop kids and family store in Hitchin to offer you the chance to win one of two ‘Selfie Clothing Colour In Tops’ (worth £16.95), PLUS a 25% discount on any other purchase from the store. These beautifully-packaged creative kits include a long-sleeved round-neck top, six fabric colour in pens, and a colour in practice sheet for ages 2-10. Perfect for keeping your kiddies amused while you enjoy a quiet cuppa. Our two winners will be invited to Rosita Lollipop to choose their kit from the selection available in store. They will also be offered a 25% discount on any other purchase from the store on that day. Rosita Lollipop is an absolute treasure trove of kids fashion and unique toys, gifts and treats. You’ll find brilliant brands such as Maxomorra, Tobias and the Bear, and Bob & Blossom, plus Irregular Choice shoes. All you need to do is enter via Gleam below and tell us the name of your favourite children’s clothing brand. This giveaway closes at midnight on Monday, 8 October 2018 so please make sure you get your entries in by then. Full terms and conditions are available below. I love mini Borden as the quality is amazing. I have 3 girls and everything lasts well enough to be passed down 3 times! I love Mini Boden and Joules! I love Matalan for my two. Cheap but last the distance. There are so many but I actually like Morrison’s and M&S children’s clothing the best. I love gap (although can be a little expensive) and F&F at Tesco, surprisingly good quality and some beautiful outfits at times! I like Gap and Next. Vertbaudet is my absolute favourite brand for my kids. I love the supermarket brands, F&F, George and nutmeg, gorgeous quality clothing for very reasonable prices! Mini Boden is gorgeous but sadly quite dear! Next because they are the clothes that fit best. I like Next because there are some great designs and the shaping fits my little one’s tall frame quite well. My daughter loves Primark and New Look – relatively cheap to sort her wardrobe out lol!! I love Mini Boden, it’s excellent quality. Joules is one of my favourites! I adore Next Kids Clothing range. I love Boots mini Club! i love my little man in J by jasper conran just too cute! I love George at Asda…the clothes see to be super quality, long lasting and the 100 day guarantee gives peace of mind. Oh, its hard to pick one. Current faves are: Jacadi, Blade & Rose, JoJo Maman Bébé & Lily & Sid. I also cannot leave Zara Kids or Next Kids without armfuls of new, cute clothes for my little girl! I love Boden for kids but it’s a bit pricy! We love F&F and Next. I love Mini Boden – their items are so unique and beautiful. I love next for kids good quality clothes that don’t mind rough play! I Love Next clothes but TK Maxx also have some great items too! George at Asda, I find the quality good and if its not you can take it back up to 100 days after purchase. Next always seems to be very popular with my little one. My new fave shop is Layla and Pops which I found through Instagram. So many cool handmade shops on there… Also like Next. I like M&S, H&M, Mothercare, Boden, so much choice!